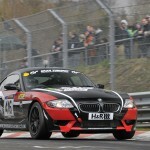 Just 10 days from the last attempt – VLN #2 is this coming weekend. The car is repaired and ready to go – the drivers are keen to get the season started properly and be prepared for the 24h in May. More news after the weekend. We had a good solid weekend. The car ran well and we leaned some things about the car. We didn’t run in practise with the car and team arriving Friday afternoon just in time for a hectic scrutineering caused by the organisers messing up our paperwork. Thankfully some local contacts were extremely helpful. Saturday morning qualifying ran cleanly but we kept running to a minimum to ensure the car would get to the race this time. Mark offered me the start which was mostly dry, and on slicks. Even on the warm up lap there was a VW on fire on the exit of the Karussell! For the first seven laps somewhere or other on the track was very slightly damp and there were plenty of crashes bring out the yellow flags. Lap 8 was completely dry, but my in-lap. Mark took over and did his 8 lap stint starting to get to grips with the car and bring the lap times down, returning the car to me to run to the finish. I did about 4 laps when the race was red-flagged because of hail at Hohe Acht. We needed to get a good reliable race and get to the finish – the team were delighted with our progress and we’re really looking forward to the next race and working on the lap times. We now have a much better understanding of the fuel usage and some tuning of the suspension will help settle the car and improve the lap times.